Create the look of woven glass with a few fun fusing tricks! In this new Dabble class, you will learn to easily and safely cut and assemble transparent and opaque sheet glass. 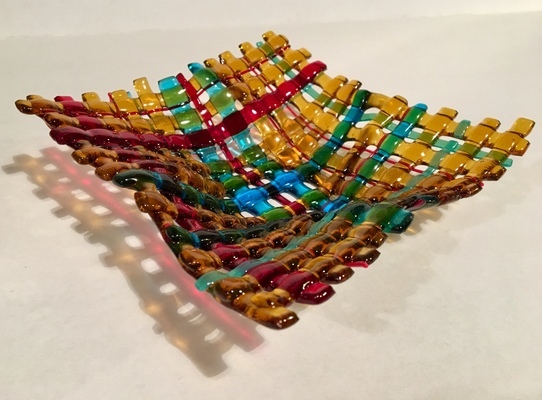 Create your piece with colorful glass strips, stringers, and noodles that will turn it into a beautiful and textural piece that has depth and textile-like qualities. The pieces will then be slumped (shaped) into a variety of forms to look like fabric. Your pieces will be 6" x 6". All materials and firings are included. No experience needed. Bring a beverage of your choice and snack to enjoy while creating your fused glass dish. Please bring your own cups and utensils. Wear closed-toe shoes and layers (in case it's chilly in the studio). Great for a date night or a girls/guys night out! No experience needed. 21+ if you plan to drink. Fused Glass Votive Candle Holder: Make Your Own!